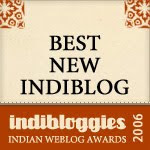 Rachna Dhir, our beloved guest reviewer, weaves in a cluster of two charming stories set in the north-eastern states of India. Thank you Rachna! Since we all are a part of the growing Saffron Tree family, it is a given that we love books and so do our children, students and friends. The shift from print to digital is a topic of concern, beyond mere conversation, for many of us. What will happen to physical books that we love to touch and feel and smell, we often wonder? However, can we step back and devote a minute to how the switch from oral story telling to written scripts might have taken place? In other words, how "a language is born"? A new written language has recently taken birth, with the first printed book in Mishmi, a language which so far was only an oral one. For the longest long time, children and adults in the North East Indian state of Arunachal Pradesh, have been speaking in Mishmi in addition to speaking, reading and writing in English and Hindi, taught in schools. Chennai based publishing house, Tulika, got the honour of bringing to the world with pride the first - round of applause, please - ever book in Mishmi and what's even better is the fact that it is a CHILDREN's BOOK!!!! I was told by my Kannada teacher a few years ago, that Telugu (spoken in the Indian states of Andhra Pradesh and the newly created Telangana) was an oral language that borrowed its neighbouring state Karnataka's Kannada script when it wanted to move to printed material. Similarly, when the book was to be published, it was decided that the English script will be used for the printed version of Mishmi! 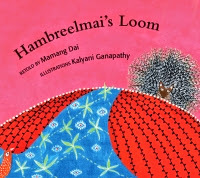 Retold by Mamang Dai and illustrated by Kalyani Ganapathy, Hamreelbai's Loom, is based on a folktale that tells the story of how weaving came to the Mishmi people. Hamreel is a species of fish with patterns on their bodies, in Mishmi language. Besides birds, butterflies, fish, clouds, waves and ripples in water, fern, bamboo, flowers, this is a simple story of a girl and a porcupine. Mamang Dai is a Padma Shri awardee from Arunachal Pradesh. Besides being a novelist and a poetess, she has also been a journalist and civil servant who is "drawing attention to the disappearing traditions of her state" by documenting her native customs and culture. While Kalyani Ganapathy lives in the Nilgiris, she has been able to capture the essence of Arunachal Pradesh's textiles and nature beautifully. According to the jacket, "she is passionate about handcrafted motifs, patterns and I textiles." Another feather in Tulika's cap is the first ever children's book in Meghalaya's Khasi language for children -"The Race of the Rivers"! The traditional folk tale is translated and retold by Esther Syiem, a professor of Literature in Shillong. The illustrator, Benedict Hynniewta, teaches painting in the same university as Esther, the North Eastern Hill University. 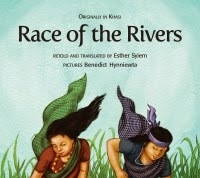 The folktale is about two sisters who take up the form of rivers. Many words from Khasi language are explained as the story progresses. The book is filled with dreamy illustrations that make each page a true delight! From the beads of a necklace to the fruit on a tree - young children are bound to be amazed by the details and go over the pages even when the story is not being read to them. When politicians talk of "national integration", they could well start with children and their books, for best and long lasting results. What Tulika has done over the last fifteen years is commendable as they brought us classics including "Who will be Ningthou? ", "The King and the Kiang", "Bijoy and the Big River", "Bulbuli's Bamboo" and introduced cultures of the North Eastern parts of India to the world! Local authors and illustrators have the special gift of sharing cultural nuances that outsiders or tourists could easily overlook. Both these books are living examples of why adults need to choose children's books not just for the stories but so many other reasons as well!! Congratulations to Mamang Dai for her first book in the Mismi language and to Esther Syiem for her first book in the Kashi language! And thanks to Tulika for bringing these books to the world. Had a great time narrating these at the Lit Fest...pity we know so little about the North East! !